The ladybug is one of Canada’s most beloved insects. Many people believe that there is only one species of ladybug native to North America and that you can tell how old ladybugs are by counting the spots on their backs. In reality, North America had has over 450 native species of ladybug, also known as lady birds or lady beetles. The number of spots on a ladybug’s back depends on the species, not the age of the insect. For instance, if you count 12 spots you are looking at a convergent ladybug, whereas if it doesn’t have any spots it is a polished ladybug. Ladybugs may also vary slightly in colour, ranging from red to orange. If the conditions are right, they can live for two to three years. The body of a ladybug is a round or oval dome shape with short legs and antennae. While they are born black, they develop their beautiful bright colouring and distinctive black spots in the first few weeks of life; however, as they age their spots begin to fade. Their colouring is not only beautiful but also serves to protect the insect. In nature, bright colours such as blue, red and yellow usually signal that the animal bearing the colour is poisonous. Many reptiles and insects use this to their advantage, evolving bright colours to warn predators that they are not a suitable meal. In addition to their bright colouring, ladybugs are able to defend themselves when attacked by playing dead and secreting a substance from behind their leg joints that will cause them to taste and smell terrible to their predators. This will often, very quickly, teach other animals not to pursue a ladybug for dinner. A female ladybug will lay hundreds of eggs at a time. She will often choose to place them inside colonies of aphids or other plant-eating insects. When the eggs hatch, three to five days later, the young are immediately very hungry and begin looking for food. Luckily, their mother has made their favourite food source readily accessible. It will only take, on average, one week for a juvenile ladybug to reach adulthood. Ladybugs do not migrate and overwinter in warmer regions. Instead they hibernate, searching for warm, dry places to sleep in over the long, cold winter. Because they are cold blooded, meaning that they rely on their habitat for warmth, they require a place where they can stay warm for the winter, such as inside buildings. Ladybugs will begin scouring buildings in search of cracks and holes through which they can get inside. Many will end up in homes, but it is best to put them back outside if you see them because houses lack a suitable food source to sustain the ladybugs until they begin their hibernation. During hibernation, ladybugs rely on their fat reserves to last them until the spring, when they can once again begin to hunt. Historically, the presence of ladybugs has held many different meanings for different cultures. 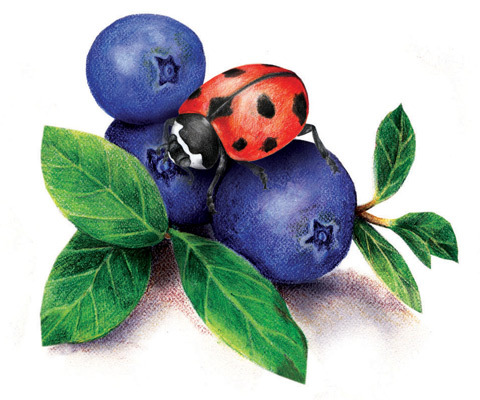 English farmers believed that ladybugs were a sign of a good harvest. If a ladybug landed on the hand of a young Swedish woman, it was believe it was measuring her for wedding gloves. In Canada, a ladybug hibernating in your garage is a sign of good luck. Medieval Europeans believed that ladybugs were sent by god to save farmers’ crops. There is some truth behind this belief. Ladybugs are aggressive predators of many aphid species and nectar-sucking insects that normally feed on crops and gardens. Each ladybug can eat as many as 500 aphids a day. They are so useful as agents of pest control in gardens, crops and orchards that our love for the lady beetle has landed North America in a bit of trouble. Multicoloured Asian lady beetles, a ladybug species native to Japan, were introduced in North America in the 1970s to help native ladybugs control aphids that were damaging crops. Unfortunately, this created an infestation that is resulting in declines in the populations of our native species. Asian ladybugs have a faster reproductive cycle, giving them more young every year. In addition to increased birth rates, the invasive beetles are also able to withstand colder winters, which means fewer individuals die during hibernation. These two factors combined have resulted in the Asian ladybug taking over as the predominant ladybug species in Canada. The Asian ladybug is slightly larger than Canada’s native ladybug species and varies slightly in colour. The invasive species typically ranges in size from six to 10 millimetres long and ranges in colour from a mustard yellow to a dark, reddish orange. They do not have a consistent number of black spots on their wing covers like our native species, and some may not have any spots at all. Because of their bright colouring, birds and other animals are often reluctant to eat them, knowing they will not make a tasty meal. While aphids are their favourite food, the ladybug diet also requires pollen. There are specific types of pollen that ladybugs are especially attracted to. The most popular pollen comes from plants that have umbrella-shaped flowers such as dill, cilantro, caraway, fennel, angelica, tansy, wild carrot and yarrow. These fresh herbs and vegetables are also great in your garden. Other plants that attract ladybugs include coreopsis, dandelions and scented geraniums. Another important aspect of keeping beneficial insects in your garden is to keep harmful pesticides out. This is especially important for ladybugs because their diet consists largely of the soft-bodied insects that would naturally live in your garden. They are so efficient at keeping plant-eating insects at bay that they are sold as an alternative to chemicals, although creating a ladybug-friendly habitat is usually the better bet to keep them in your garden. Having a natural garden is also healthier for the environment, as well as your family and pets.